Not since the early 1970s has there been an attempt to describe and illustrate the anatomy of the developing mouse embryo. More than ever such material is needed by biologists as they begin to unravel the molecular mechanisms underlying development and differentiation. After more than ten years of painstaking work, Matt Kaufman has completed The Atlas of Mouse Development--the definitive account of mouse embryology and development. 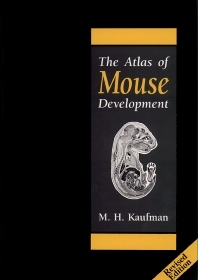 For all those researching or studying mammalian development, The Atlas of Mouse Development will be the standard reference work for many years to come. Development biologists and molecular biologists studying mouse development. Preimplantation Period. Stages 1-5. Postimplantation Period. Stages 6-26. Scanning Electron Micrographs, and Special Systems: External Appearance of Intact Embryos Isolated between 7.5-9.5 Days p.c. (Text Associated with Plate 42). External Appearance of Intact Embryos Isolated between 9.5-11.5 Days p.c., and Differentiation of the Limbs over the Period from 9.5-117.5 Days p.c. (Text Associated with Plates 43-145). External Appearance of Intact Embryos Isolated between 11.5-118.5 Days p.c. (Text Associated with Plate 46). Differentiation of the Cephalic Region in Embryos Isolated between 9.5-111.5 Days p.c.--Scanning Electron Microscopy Series (Text Associated with Plate 47). Differentiation of the Eye--Scanning Electron Microscopy and Histological Series (Text Associated with Plates 48-153). Differentiation of the Pituitary (Text Associated with Plates 54-157). Development of the Tongue (Text Associated with Plate 58). Closure of the Palate (Text Associated with Plates 59-162). Morphology of the Spinal Cord (Text Associated with Plate 63). Early Stages in the Development of the Heart (Text Associated with Plates 64 and 65). Differentiation of the Lungs (Text Associated with Plate 66). Histochemical Demonstration of Primordial Germ Cells (Text Associated with Plate 67). Differentiation of the Urogenital Ridges, Gonads, and Genital Duct System (Text Associated with Plates 68-171). Differentiation of the Kidney (Text Associated with Plate 72). Discontinuities Occasionally Found in the Visceral Yolk Sac (Text Associated with Plates 73 and Plate 74, a-1f). Differentiation of the Placenta (Text Associated with Plate 74, g-1i and Plate 75). Disposition of the Extra-embryonic Membranes Associated with Various Types of Twinning (Text Associated with Plates 76-179). Asynchronous Implantation (Text Associated with Plate 80). Embryo Code Numbers for Serially-Sectioned Embryos Illustrated in Plates 1-141. Chapter References.